Is Google replacing our brains? 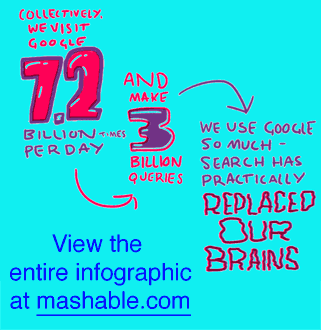 Mashable had a fun infographic that talks about how Google is replacing our brains. I would argue that Google is replacing our parts of our memory, not our brains. We can still think about things, we just don’t always have to remember what those things are. Google enables us to be curious about more things. The ability to find answers to questions immediately makes us more inquisitive. How do I do this? Where is this person? What is the best place for this?